From Dlyn, a BBFF and partner in crime, so to speak, a meme she created herself. Almost as much fun as the spider with a man's head meme. Almost. I wonder what I can do to make it MORE interesting? Let's see, shall we? It is a photography meme. Yay! I get to take pictures of Fred and Bessie! Oh. Wait. They're not here anymore. *sniff* If you know where they are, PLEASE tell me. I miss them so. It's getting kinda weird around here. 1. Step out your front door and take a picture. 2. Step out your back door and take a picture. 3. Put them on your blog, along with the rules. 4. If there are things in the photos that you particularly like or dislike, you can point them out, or just explain what we are seeing. Maybe changes over the seasons or some junk in your neighbor's yard that drives you nuts. 5. Tag as many or few people as you like - preferably at least one though. 6. Do it again next month if you like. 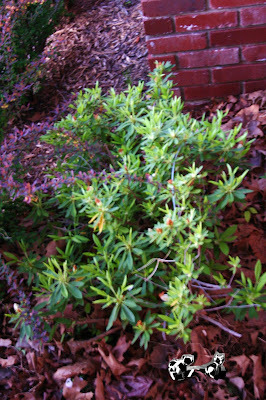 And this is the azalea right next to the front door. It's hard to tell, but it's covered in buds, getting ready to bloom. Yay! Here's our back yard, garden waiting for plants. 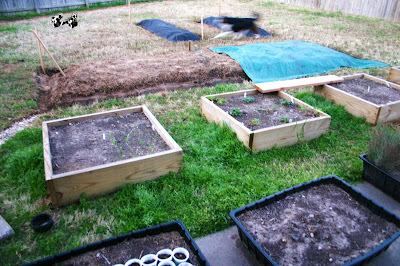 If you look carefully, you can see the onions coming up in one of the raised beds. I don't think I have the energy or wherewithal to tag anyone. Take what you'd like. Really. I'm going to go mope now. If you see the bovines, please yell at them for me, for leaving and scaring me so. Bad cows. P.S. Thank you for all your kind suggestions and ideas. I'll be talking about them tomorrow, if the cows still haven't come home. I think the cows got out! Great pics - wan't wait to see the azalea in bloom. We don't even have our veggie garden plowed yet! Thanks for playing! I love photography memes-- I will tag myself! In a day or two... I'm busy packing, but I wanted to say Hi. I love your garden and raised beds. I wish I had a green thumb. I am trying. But it is just not working. 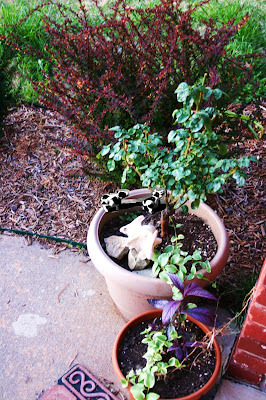 You have two very sneaky cows!! So you're saying that unless I go see a comedy you won't come with? I love your pictures and am so jealous. My front and back yard are still brown from winter - sigh! ps. I'm sorry your cows are missing. Hopefully they are on a wonderful adventure and will come back with lots of stories! Look at all those lovely growey things! I think I have an empty cat litter box out my back door . . .